My husband and I are HUGE ‘Cirque du Soleil’ fans. I’m talking HUGE. 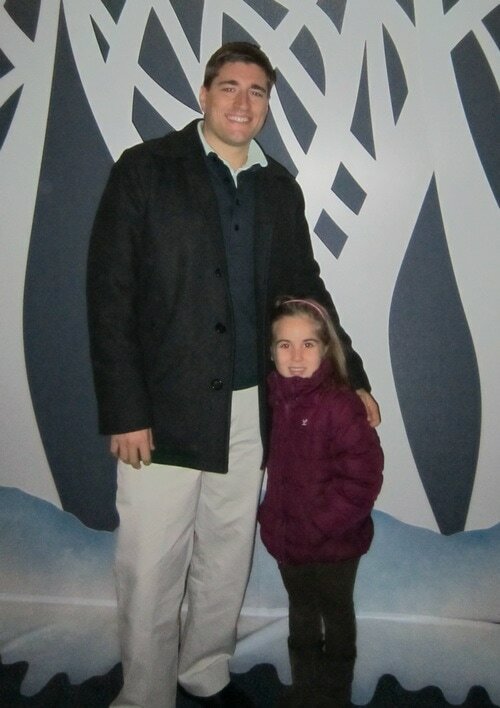 We’ve seen several shows as a couple, but Sunday was the first time we brought the kids along. The Wintuk stage was set as a magical Winter Wonderland. Light posts sung, everyone had extraordinary abilities, cops were acrobats, robbers got creative with their escapes, and the main performers left us watching with our mouths wide open. Two big highlights I want to mention – one of which is the rock monsters. My son was completely AMAZED by the trio and sat VERY STILL during the scene, but Natalie did not really like their presence. She’s 5 and sensitive, so this part was… not her favorite. Natalie preferred the dogs. They were so cute and I’m pretty sure my kids thought they were real. 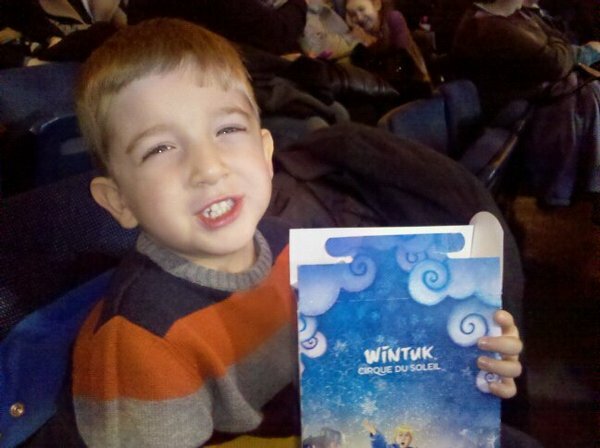 Jumping, flipping, spinning, dancing – it was really fun to see the show through their eyes. 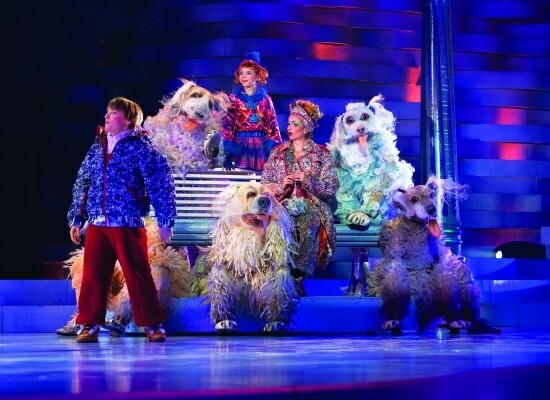 During the first half, they didn’t really care for the human performers – but once the dogs entered the game, the kids just lit up. The second highlight I want to mention is the finale. 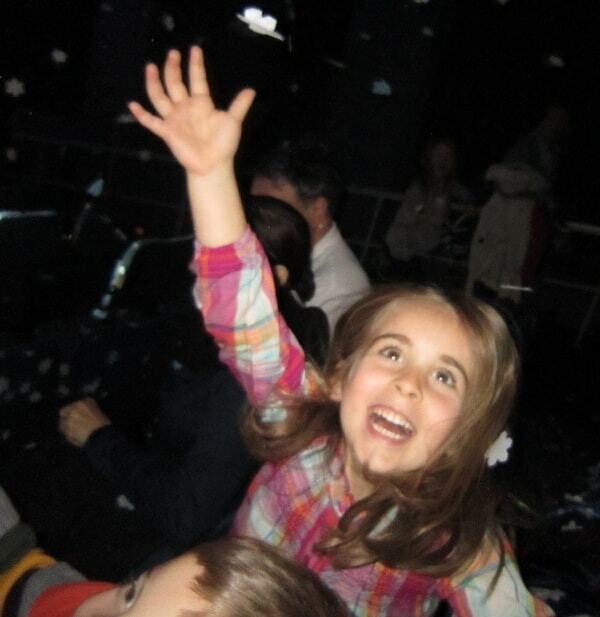 Millions of pieces of snow paper fell onto the audience and I almost started to cry watching the joy that was seeping out of my daughter’s soul. I mean, the look of excitement she had on her face is something I will never forget. It captured childhood and its essence. I grabbed my camera and tried to snap her in action as best I could. You aren’t allowed to use cameras, but I couldn’t help myself and made sure I didn’t snap the stage. Suddenly, the show became “the best show ever!!! !” according to my kids. The snow was such an experience that it’s all we’ve been talking about for days. They stuffed my purse with as much snow as they could before we left Madison Square Garden. It was really so much fun! Overall, Bill and I enjoyed the show. In the end, Natalie and Liam were really happy too. We had a great family night out! This is the LAST year to see Wintuk. Visit Madison Square Garden’s website for more details on how to get tickets. Thank you for a great blog on Wintuk !! !